There is no doubt about the fact that dementia is one of the world's most dreaded diseases. Characterized by memory loss, confusion, and cognitive decline - dementia is prevalent among senior citizens. In fact, on average, one in every 6 people over the age of 80 is diagnosed with it. Startling statistics show that around 47 million people were affected by dementia in 2017 alone. The number is expected to reach a figure of 75 million by the end of 2030! But according to the latest research, women may be more susceptible to dementia as compared to men. Since women have better recall and memory compared to men, the early signs of dementia are often missed. 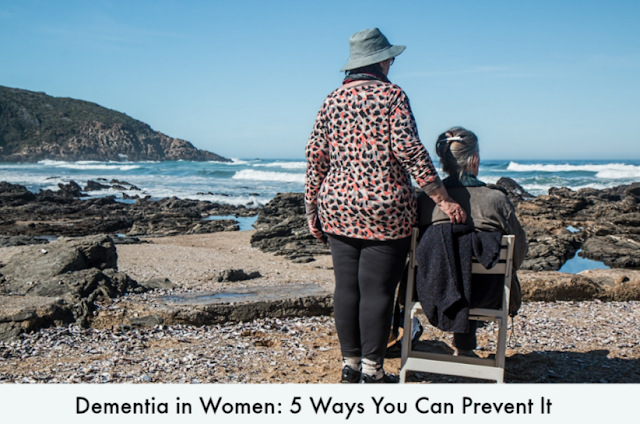 A World Health Organization report claims dementia to be one of the top five causes of death in women all over the world. The reason why more women are bearing the brunt of this disease is that they are prone to the risk factors that cause dementia. For example, women are more likely to develop depression and mood swings due to menopause and hormonal disturbances. Pregnancy complications like pre-eclampsia have also been linked to cognitive decline in later age. If you haven't started exercising daily, then here are tons of reasons that should motivate you to do so. Research proves that women with better physical fitness at middle age are nearly 90 percent less likely to develop dementia in later years. Even if physically fit and healthy women were to develop dementia, they were diagnosed almost 11 years later than those who were unfit. What's more, physical fitness during midlife not only boosts the brain but also saves women from several physical illnesses. Daily exercise helps maintain healthy blood pressure, keeps obesity at bay and produces a better lipid profile. Research also suggests that exercising every day can boost one's mood by releasing endorphins (the hormone which makes us happy) and acts almost like an anti-depressant. Doctors suggest that women who have high blood pressure during their 40s have an increased risk of developing dementia in older age. This is why women should be particularly careful about managing their blood pressure levels. Controlled blood pressure not only protects the body against diseases like stroke and other cardiac illnesses but also prevents Alzheimer’s-type dementia. Eating a lot of sugary foods and refined carbs can be the leading cause of developing pre-dementia and dementia. These foods wreak havoc on your blood sugar levels and can also make you insulin-resistant, thus causing diabetes. According to recent studies, people with diabetes have a four-fold risk for developing Alzheimer’s. Most women have strong food cravings. A tough day at work or a sleepless night often causes them to reach out for sugary and salty foods or alcohol. But giving in to cravings is not a lack of willpower. In many cases, cravings are a signal of underlying hormonal issues that arise due to inadequate nutrition. In such cases, we suggest you get yourself checked. If you are feeling forgetful and eating sugar and refined carbs on a regular basis, then we recommend you to go to your doctor. The doctor will schedule you for a simple brain test. You can also take an online brain test yourself. Most of the brain test reviews are positive and can help you in early diagnosis of the disease. You'll be surprised to know that one in three Americans doesn’t get adequate sleep and 45% of the world's population doesn't either. Women are even more prone to sleepless nights because of hormonal imbalances and multi-tasking between the workplace, home, and children. Disrupted sleep puts one at an increased risk for developing diabetes, stroke and cardiovascular disease. But can inadequate or poor sleeping habits cause dementia? A new study in the Journal of Neurology suggests that people who get less REM (the fifth stage of sleep) or dream-stage sleep, are at a higher risk of developing dementia. If you are finding it difficult to sleep at night, then try a soothing nighttime ritual before bed-time to help yourself relax. Research proves that cognitive training can reduce the risk for dementia in the long run. Any activity which includes problem-solving and information processing can help strengthen brain muscles. Research published in the Caspian journal of neurological sciences highlights that brain training certainly helps improve cognitive function in senior women. The best part about it is that you can select any challenging activity that you enjoy. Whether it is learning a new language, joining a cooking class or even taking piano lessons - anything that stimulates your brain can help reinvigorate it. A new activity can wake up your brain and stimulate the growth of healthy brain cells. You're training the brain to adapt and solve problems, as new messages are fired in your brain. Remember, what's good for the body is also a source of nutrition for the brain. So, lead a healthy lifestyle by eating wholesome and nutritious foods and exercising daily. Another great way to socialize and get help is to join a support group for dementia. Humans are a social species, and the brain yearns for relationships and social interactions. This is why meaningful conversations and social interactions can help keep dementia at bay. Research proves that seniors who are more social had a 70% reduction in the rate of cognitive decline as compared to their peers who were least social.